Are you looking for something to really get the kids excited, something completely different that will really stimulate their imaginations? Our “Family Falconry Adventure” is the ultimate for fun loving families with a thirst for knowledge and adventure. During this falconry experience you will learn about the differences between the hawks, owls and falcons and experience the thrill of them flying to your fist and feeding them. 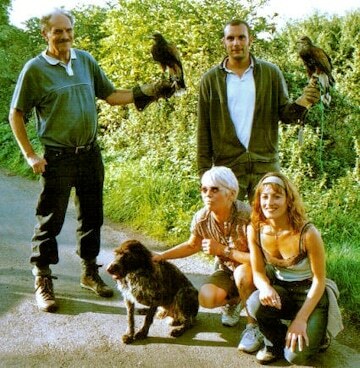 Remember this is a falconry day just for your family. 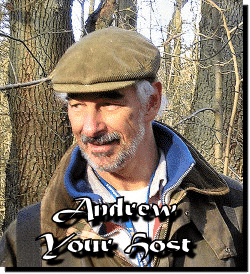 You will be out in our fantastic countryside setting where our friendly falconer will tell you lots of interesting facts and answer all of your questions. There will be ample time for photo opportunities and the falconry experience will end with a short hawk walk where our friendly Harris hawk will follow from tree to tree and swoop down to your fist for treats. Oh, I almost forgot to say, adults really enjoy it too. Our “Family Bird on the Hand” is the ultimate for fun loving families with a thirst for knowledge and adventure. During this falconry experience you will learn about the differences between the hawks, owls and falcons and experience the thrill of them flying to your fist and feeding them. Remember this is a falconry experience day just for your family. The cost of this special session, which is available in limited numbers, is £295 for weekday bookings and £395 for weekends and bank holidays. Click for more details and to purchase. This falconry experience is just for your family or group. The falconry experience lasts approximately 3 hours and can sometimes be held on summer evenings. 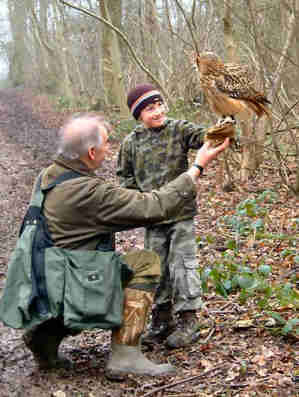 Our “Family Falconry Adventure Day” is the ultimate for fun loving families with a thirst for knowledge and adventure. During this falconry experience you will learn about the differences between the hawks, owls and falcons and experience the thrill of them flying to your fist, handling and feeding. We then have a hearty lunch, alfresco if the weather is fine, and in the afternoon we introduce you to some more of the hawks and go for a hawk walk with the Harris hawks where they follow us around the fields flying for titbits and often shooting off after anything they think looks like a possible meal. We then fly the bigger owls and hopefully our new arrival for summer 2019, a red kite. The cost of this special session, which is available in limited numbers, is £495 for weekday bookings and £645 for weekends and bank holidays to cover a group of six. Additional participants £15 each. Please call to discuss your requirements. or Click for more details and to purchase.